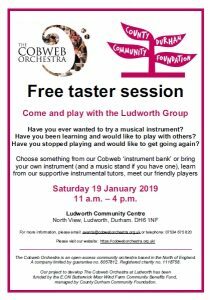 The Cobweb Orchestra recently received a generous grant from the Durham Community Foundation to develop the Ludworth Group. We’d like to attract new players to the group by providing opportunities for anyone to come and join in, even if they are complete beginners. There will also be four tutors to give you guidance on how to play the instruments, and how to follow music and a conductor. You will be in safe hands, as they are already quite accustomed to Cobwebs! Peter Gulbis from our Billingham Group will lead the string section, while Laura Reavley, our Morpeth Group leader, will be in the wind section. Clare Carr used to conduct the Billingham group and after kindly taking over the baton at Ludworth for a while last year, she is looking forward to returning to help the brass section. We are also pleased to welcome back our Cobweb guest conductor Mark Edwards, this time to keep the percussion section in order! All Cobwebbers are invited. Perhaps there is something that you’ve always wanted to ask, or you may just want to join in and play your usual instrument. 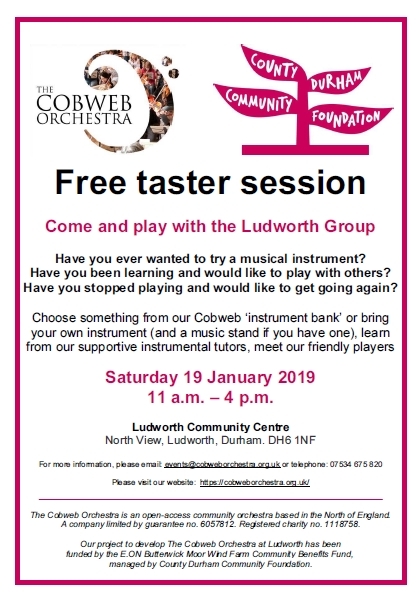 Please come and meet our friendly Ludworth players, who may not have been to any other Cobweb events yet. You can view the Ludworth Group page to see what we have been up to already. We would love you to share this exciting project with us. Ludworth is only 7 miles or so away from Durham. The event is free, with a bring-and-share lunch, plus coffee and tea for a small contribution. (Our food hygiene guidelines can be found here). You can enrol for the event in advance online here, and download the flyer here.